Portable Cables Reels are build inside a Pelican for hand carry. PCRs are stackable and store electrical power, signal and fiber optic cables for easy transportation and deployment in the field. 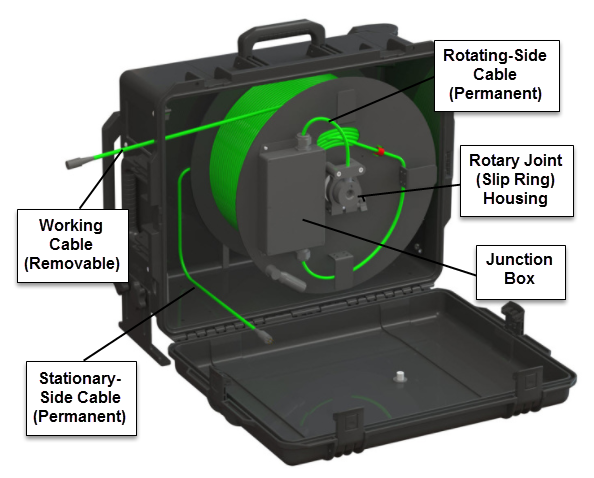 The Portable Cable Reel (PCR) is an innovative and efficient way to store and deploy control and/or power cable for remote systems. The coiling system is housed inside of a sturdy air shippable and stackable Pelican ™ Case ensuring safekeeping both in and out of use. A metal storage drum holds any cable from 1 mm fiber to 20mm multiconductor or coax and nearly everything between. The reels can be used in terrestrial, airborne or marine environments. Components are weather-tight (rated IP65 to IP66) meaning the exterior and interior can be cleaned with a hose and water. 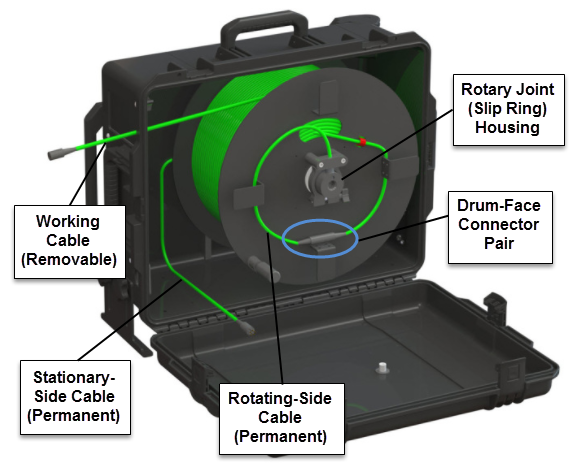 Portable Cable Reel Features regarding function and construction of the reel. Purchase PCRs for cable storage-only (non-dynamic units without a rotary joint) directly at our eStore. For dynamic PCRs with rotary joints, use the inquiry form below or call or email with your cable, connector and signal description. What's a rotary joint? See the description below. Cable is extra - either yours or let us know what you need and supply it. Our largest size storage reel holds your longer cables . 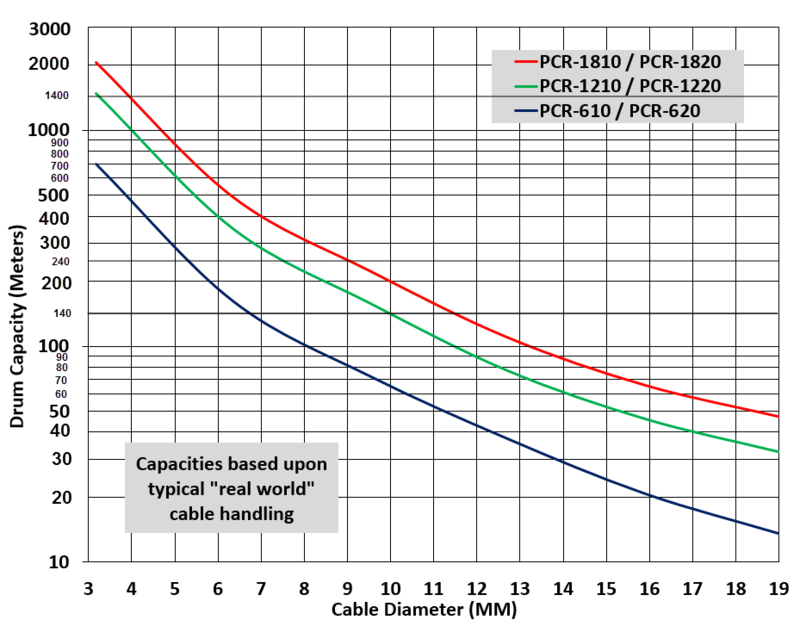 The PCR-1810 Portable Cable Real holds over 320 meters (1050 ft) of 8 mm (0.32 in) diameter cable for connection to your field equipment. The PCR-1810 is an cost effective cable reel supplied without a slip ring (rotary joint) letting the user install most any small to mid diameter cable regardless of connector type. However the PCR-1810 is upgradable - even after purchase to become the PCR-1820 and include a slip ring and connectors. ​NOTE: Adding this item to your cart confirms that you have read through, and agree to, both the Terms & Condition as well as the Shipping Policy on the "Terms & Shipping" page of www.2KRsystems.com. Our smallest and lightest cable reel with a rotary joint and connectors. Please see the PCR-620 Purchase Form on the PCR Product page to define the connector and rotary joint requirements. Our mid-sized Portable Cable Reel fitted with a rotary joint and connectors. Can be supplied with junction boxes for interconnections, media converters (e.g. Ethernet to Fiber Optic) and Ethernet Extender modules. Please see the 1220 Purchase Form on the PCR Product page to define the connector and rotary joint requirements. Our largest size Portable Cable Reel fitted with a rotary joint and connectors. Please see the 1820 Purchase Form on the PCR Product page to define the connector and rotary joint requirements. 500 ft. of 0.25 in. dia. 1200 ft. of 0.25 in. dia. 1800 ft. of 0.25 in. dia. 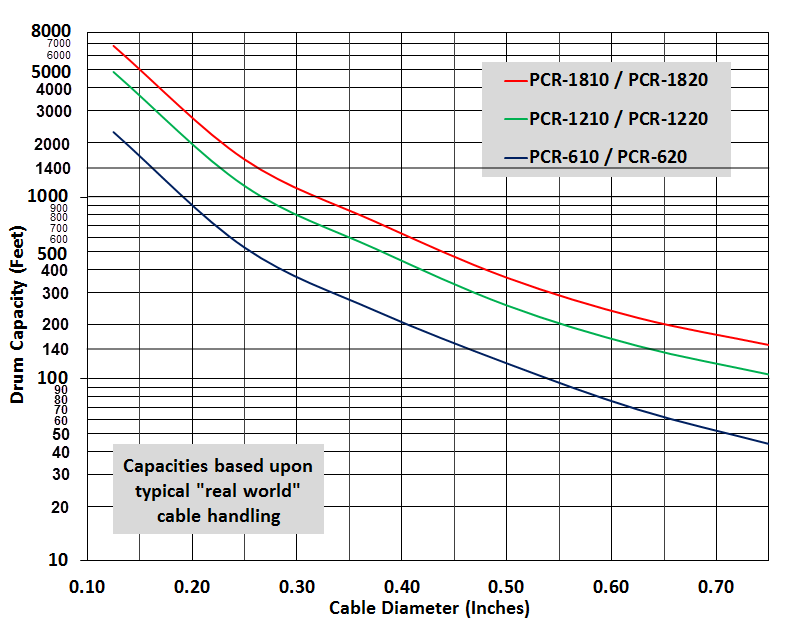 Use the graphs below to determine how much cable will fit on a specific product. US units graph is on the left and metric is on the right. Values are for typical real word winding found in the field. So if you're carefull you can usually load more cable than stated. There are two families of PCRs: dynamic reels with rotary joints and storage-only reels without rotary joints. Two common examples employing a rotary joint are the ubiquitous plastic garden hose reel and airhose drum reel found at automotive service centers. In these examples rotary joints allow the hose to be wound or unwound on the drum while fluid or air is flowing. Our rotary joints pass electrical and/or optical signals through electrical and fiber optic cables also while the storage drum rotates without the cable twisting. Signals can be up to 600 volts, low or high current, RF band, serial data, 100BaseT or Gigabit Ethernet or even single or multimode fiber optic. Units are supplied with virtually any available connector set as long as they fit inside the ruggedized case. How do you decide which type? Simple. If it's feasible to deploy (pull out) the working cable before connecting the stationary end of the cable reel you don't need a rotary joint and should consider a storage-only reel. You'll save money and receive the cable reel sooner. However, if you need both ends of the cable to be connected and signal and/or power flowing while the drum rotates then specify a PCR with a rotary joint. The last two digits of the model number tell the story: 10 = without rotary joint and 20 = with rotary joint. Need more information? Call or email us. Or fill out the Inquiry form on the right and we'll walk you through identifying the pertinent details. These units pass electrical or optical signals while the cable drum is rotating without the cable twisting.